The weeklong program underscored Italy’s position as US top solution provider while encouraging engagements between some of Italy’s leading companies and universities as they seeked to expand existing relationships and build new ones with industry peers, suppliers and research centers. The main event was held on Tuesday June 26th, when leaders and innovators came together at the DC3S Center for Collaboration and Synergy in Sterling Heights, MI, for a full day of panels, bilateral meetings and networking opportunities. Following the conference, on the same day, a session of bilateral meetings between individual Italian delegates and US and Canadian potential prospects took place. In the days following the conference, June 27th - 28th, Italian delegates visited FCA’s World Class Manufacturing Institute, COMAU’s Innovation Center, Wayne State University, Purdue University’s Center for Innovation through Visualization and Simulation (CIVS), and the ManufacturingUSA’s innovation institutes - DMDII and LIFT where several occasions occured for the delegates to build relationships with several US counterparts. On the evening of June 28th a networking event was held at the Italian Cultural Institute in Chicago with the Consul General of Italy, Giuseppe Finocchiaro, and the local business community. On the last day of the program, on June 29th, the Italian delegation took part in additional one-to-one meetings with leading counterparts in the greater Rockford, Illinois area followed by a visit to Northern Illinois University’s advanced manufacturing research center, where delegates explored synergies and partnership opportunities. 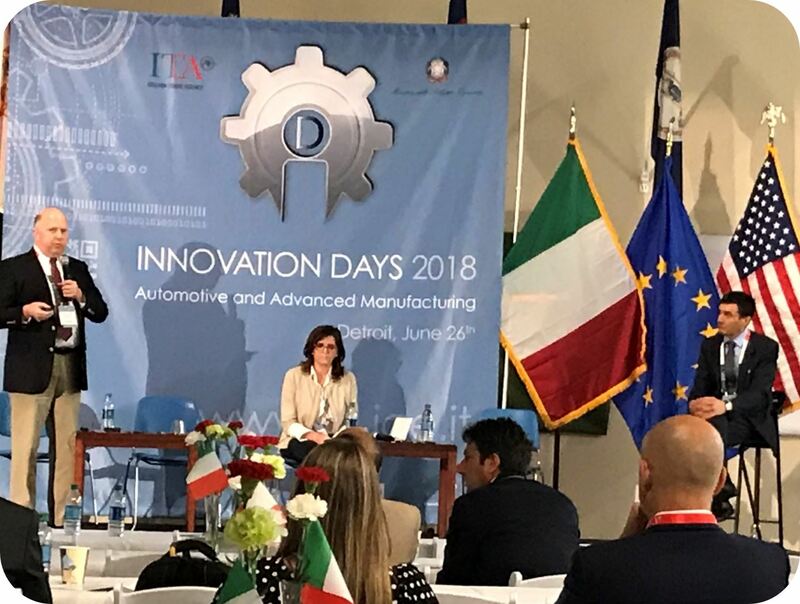 32 Italian companies participated in the June 26th, 2018 Innovation Days Detroit conference of which 29 took part in 117 one-to-one meetings with a number of the 81 US participants in attendance. And for the exclusive one-to-one meetings in Rockford, Illinois on June 29th, seven of the Italian companies held 31 meetings with 11 US companies. The Innovation Days 2018 Detroit-Chicago program has the official support of the Italian Ministry of Economic Development, Automation Alley, Chicago Metro Metal Consortium, DMDII - Digital Manufacturing and Design Innovation Institute,, Federmacchine, Italian-American Business Council of Michigan, Michigan Aerospace Manufacturers’ Association, Michigan Economic Development Council, Regional Growth Partnership (Toledo, Ohio), Rockford Area Economic Development Council and Oakland County (Michigan).